Each box was equipped with a Raspberry Pi, a small 700Mhz microcomputer that uses a version of Debian Linux. On this Pi we were able to run Pure Data and create customized sound designs. To interface with the various controllers we used the Arduino micro controller. 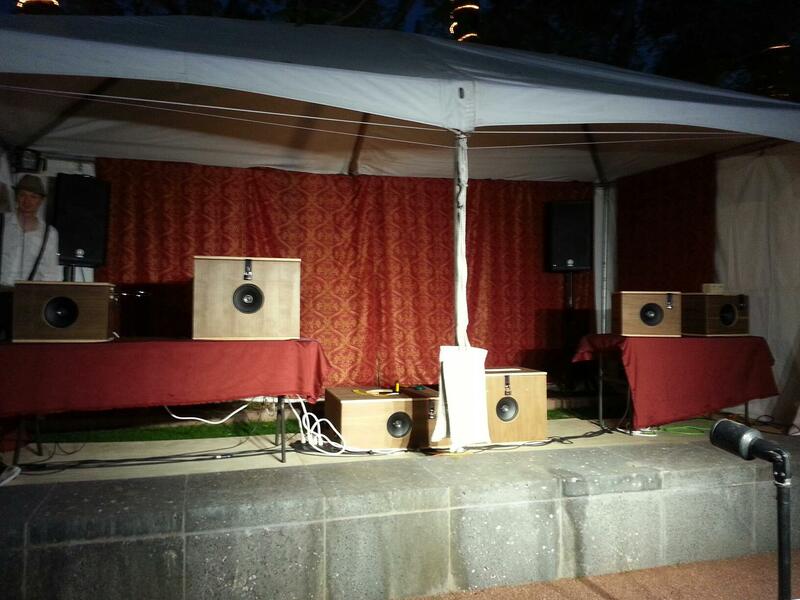 Each instrument had a small 40W amplifier and a 40W full range speaker that was attached to a Behringer UCG102. The Intonarumori were designed to be standalone instruments, essentially all they need is to be plugged in. This series of equipment gave us the most affordable and effective option for such a goal. 1) Theremin Box – Four distinct timbres that emulate 80s arcade sounds. For this I used square waves, sawtooth waves and a tricky little additive synthesis algorithm for the classic Mario jump. 2) Water Box – Uses a hydrophone input which is then passed through a custom comb filter, reverb, and ring modulation. 3) Bike Box – plays back a sample at a variable speed using a bicycle pedal and wheel unit. The wheel turns a DC motor which outputs a continuous voltage that is read by the computer. 4) Bass Box – The bass sound uses a series of Phase Aligned Format generators or PAF. These are meant to give the bass a not-so but oh-so quality to Peter Framton’s Framtone. It’s really nothing like a Framtone, but has a distinct vocal quality. The levers of the throttle change settings on a comb filter, variable delay and the frequency. We use the string as an envelope follower. 5) IR Drum Box – is based on a late 80s sampler. We have four drum samples (hi-hat, snare, tom, bass) which are then pitch shifted the old fashioned way, like a tape player, based on what the IR sensors read. 6) Blender Box – sometimes referred to as the Magic Blender. For this I used a series of off-tuned triangle waves with a distinct “wobble” for that variable speed blender behavior. Then this chord is passed through a series of variable delays which created fantastic artifacts.